Description: Carrying case for the Sega Game Gear by Laing. This is a list of VGCollect users who have Port-a-Gear Portable Storage Case in their Collection. This is a list of VGCollect users who have Port-a-Gear Portable Storage Case in their Sell List. 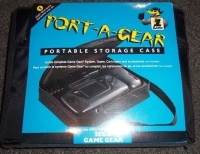 This is a list of VGCollect users who have Port-a-Gear Portable Storage Case in their Wish List.